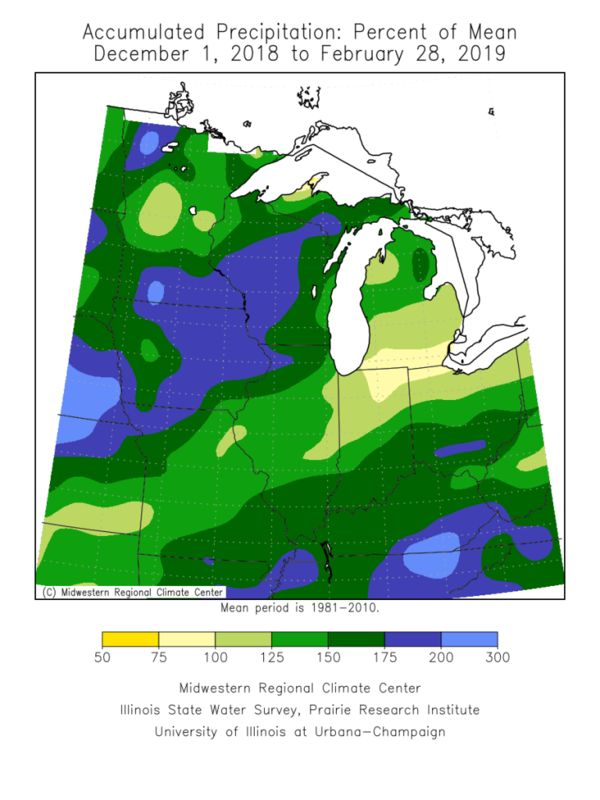 Statewide, March ended colder and substantially wetter than the long term average. The preliminary average statewide March temperature was 36.6°F, which is 4.7°F below the long term average. The preliminary average statewide precipitation was 4.16 inches, which is 1.20 inches above the long term average. Data are provisional and may change slightly over time. Preliminary results show that March 2019 finished with a statewide average temperature of 36.6°F which is 4.7°F below the long term average. 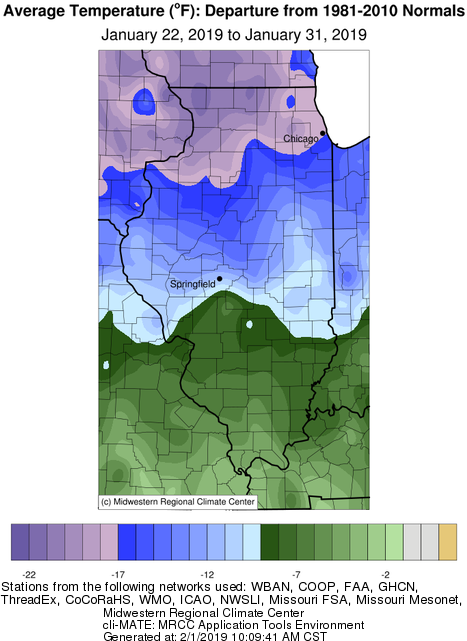 The first full week or March begun with a brutal Arctic outbreak in which temperature departures of 15° to 25° below normal were common across Illinois (see map below). During this time three stations recorded minimum temperatures of -10° or colder. The lowest reading in the state, -12°F, occurred at the Little Red School House station (Cook County) on March 5th. In contrast, the warmest reading in the state was 76°F, reported at a station near Dixon Spring (Pope County) on March 13th. 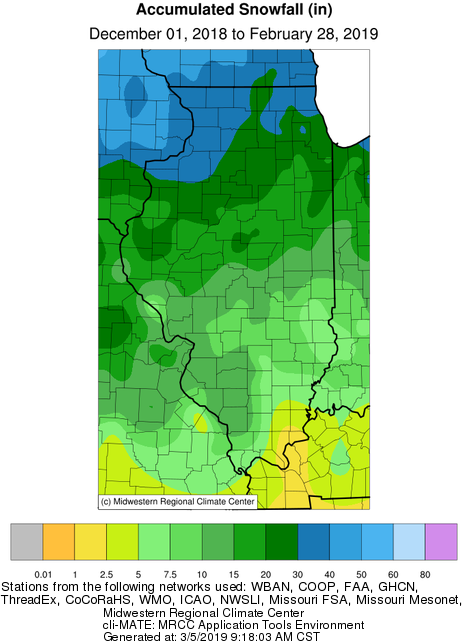 The map below depicts average monthly statewide temperature departures for Illinois. 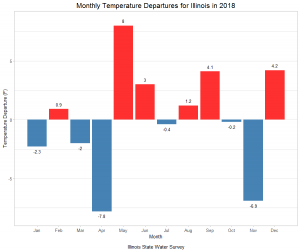 March temperature departures finished below average statewide, with the coldest departures occurring across large areas of central Illinois, and in the northwest corner of the state. Preliminary statewide average precipitation for March was 4.16 inches, which is 1.20 inches above the long term average. A persistent active weather pattern along with above average precipitation were the biggest weather stories in March. Major and historic flooding on the lower Ohio River Basin in Southern Illinois continued into the first week of March, resulting from substantial February rain events. 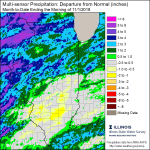 By the middle of the month, a strong and historic low pressure system brought heavy rain, storms, and strong wind to Illinois and the rest of the Midwest. The heavy rains and combined regional snow melt resulted in additional widespread flooding concerns across the region. 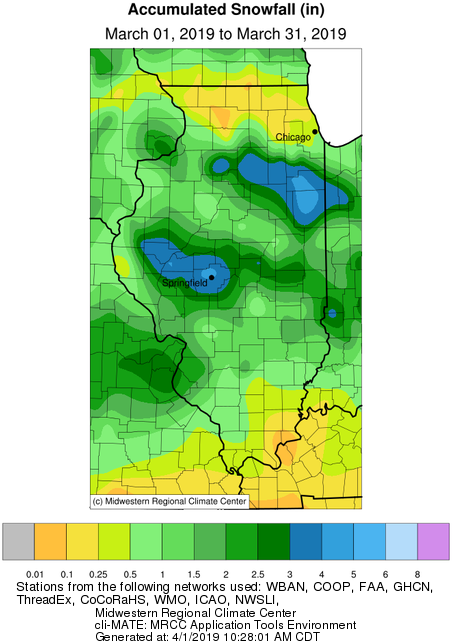 This included a major flooding event for northern and northwest Illinois, with the Rock, Fox, and Mississippi Rivers experiencing significant crests. The heaviest March precipitation fell across central and southern portions of the state where 4 to 6 inches were common. 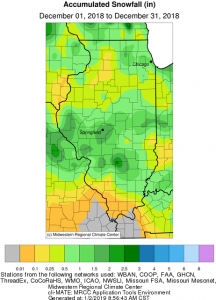 Five stations in these regions reported over 6 inches of precipitation for the month. 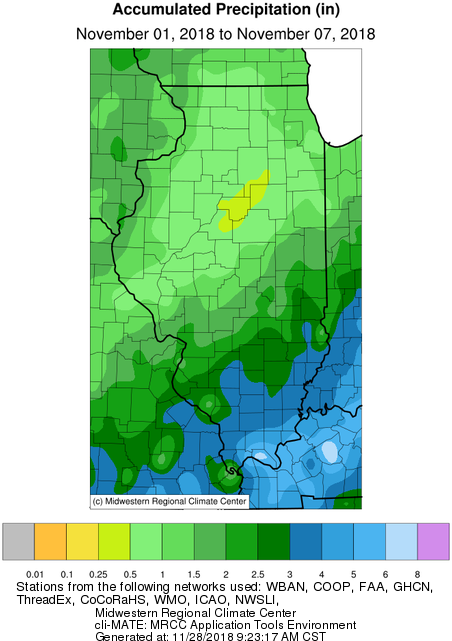 Totals were lower in Northern Illinois with generally 1.5 to 3 inches. 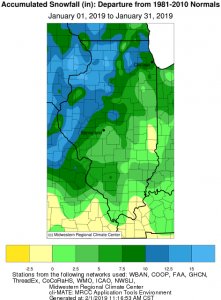 The lowest totals for the month occurred along the Illinois/Wisconsin border. 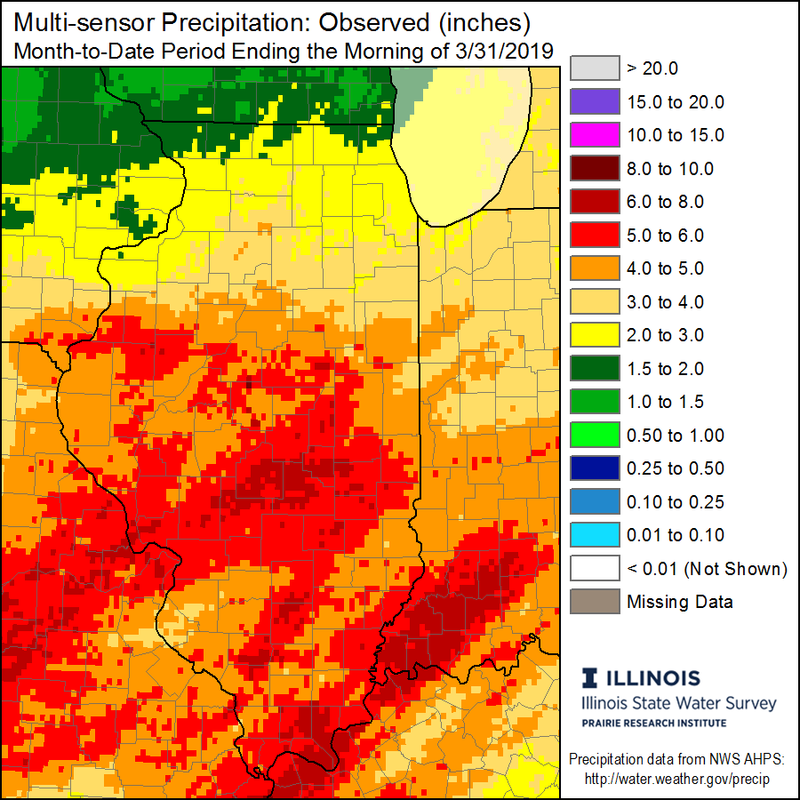 The highest March precipitation total of 6.41 inches was reported at a station near Jerseyville (Jersey County). Above average March wetness led to precipitation anomalies over 100% of average for the southern two-thirds of the state, with the most impressive anomalies of 200-300% percent of average in a large area of central Illinois (see map below). 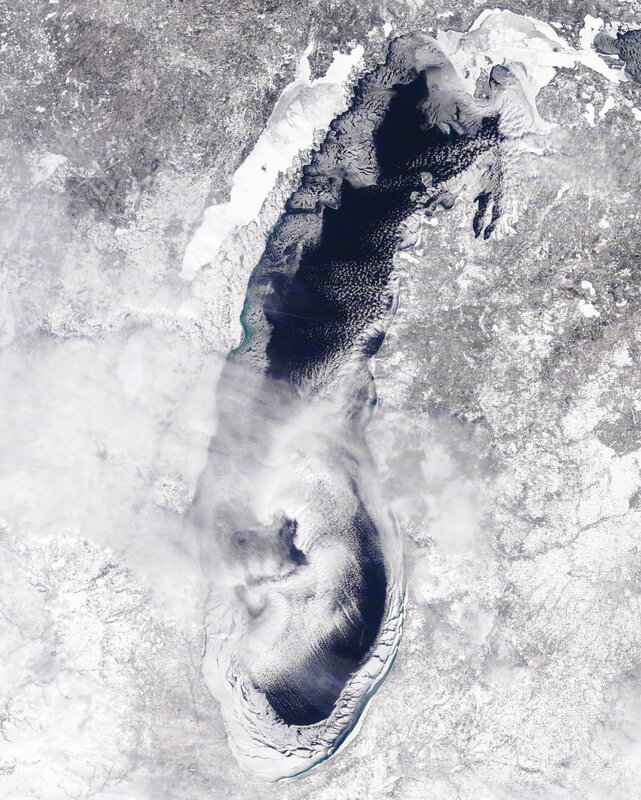 Snowfall in March did occur statewide, although it was rarely long lasting. Storm tracks are apparent on the accumulated snowfall map, with two distinct snow maximums. One in the vicinity of the corridor from Rushville to Springfield, and a second centered near Kankakee. In both cases 3 to 5 inches of accumulation were measured. Soil moisture profiles across Illinois remain in the 90th percentile or higher as we head into April. 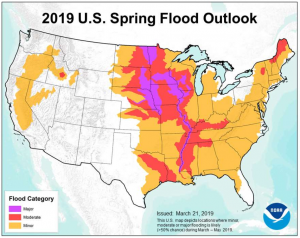 This leaves soil conditions favorable for spring runoff, and is an ever-growing concern for the agricultural community. The National Weather Service (NWS) spring flood outlook places the entire state in its flood risk zone. Eastern and central Illinois are subject to a minor flood risk, while western, extreme northern and southern portions of the state are in a moderate flood risk zone. Locations immediately along the banks of the Mississippi river are in a major flood risk zone. Looking ahead at the rest of April 2019, the Climate Prediction Center (CPC) is favoring probabilities of above average temperatures statewide. This is a welcome change compared to April 2018, which ranked as the second coldest April in state history. 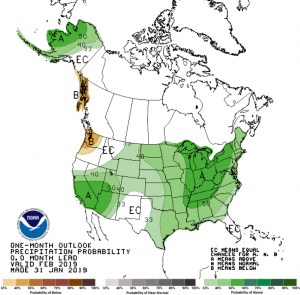 An active weather pattern looks to persist, as the April outlook favors slight probabilities of above average precipitation for the western half of the state. 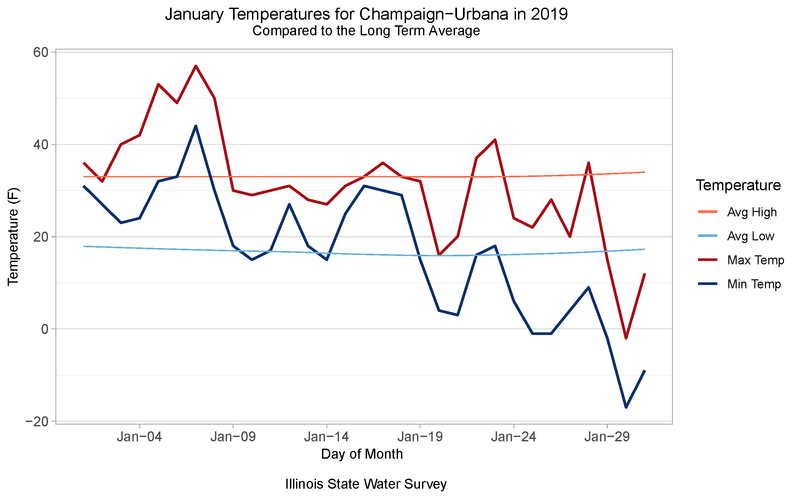 Champaign, Ill., 3/6/19: An Arctic outbreak in late January 2019 led to widespread bitterly cold temperatures across much of the Upper Midwest, including Illinois. On the morning of Jan. 31, the cooperative weather observer at Mt. Carroll, located in Carroll County, reported a temperature of -38 degrees. After a comprehensive review, the State Climate Extremes Committee (SCEC) unanimously voted to validate the -38 degrees reading as the new official state record minimum temperature. This committee ensures that the observation is meteorologically plausible, is within a range that the reporting instrument can detect, and that the instrument is in proper working order. Brian Kerschner at the Illinois State Water Survey represented the Illinois State Climatologist Office as a member of the SCEC, along with delegates from the National Weather Service (NWS), the Midwest Regional Climate Center (MRCC), and the National Center for Environment Information (NCEI). The previous minimum temperature record for Illinois was -36 degrees set in Congerville, located in Woodford County, on Jan. 5, 1999. The coldest temperature prior to the Congerville record, -35 degrees, was also set at Mt. Carroll in January 1930, and was later tied with Elizabeth in February 1996. The Mt. Carroll station is a traditional daily observing station located in northwestern Illinois. It has been in service, with minor interruptions, since 1895, and has been observing temperatures since 1897. It is operated by the City of Mt. Carroll and attended by staff at the city’s water treatment plant. 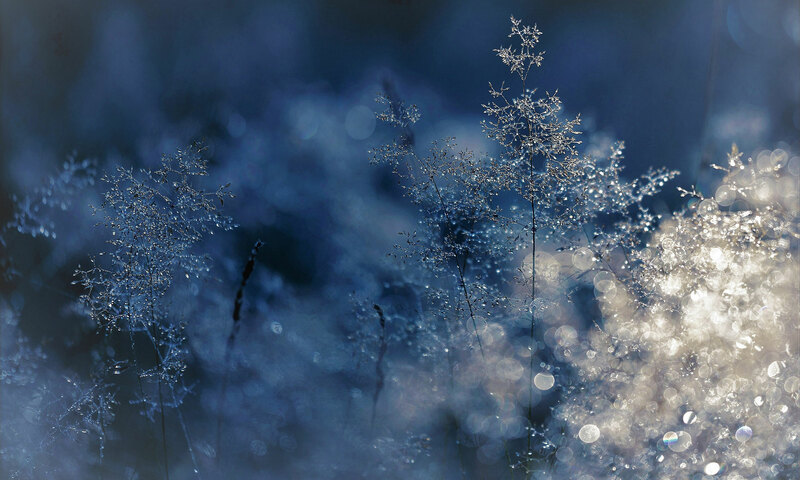 Although the first week of March 2019 does not give us the satisfaction that spring will be arriving in the near future, it does mark the end of the meteorological winter season, which runs from December – February. Despite what felt like an eternity of below average temperatures, the season as a whole finished with temperatures relatively close to the long term average. Referring to the map below, which represents average temperature departures, a few localities in the west-central and northwest portions of the state saw temperature departures of 1°F or more below average. 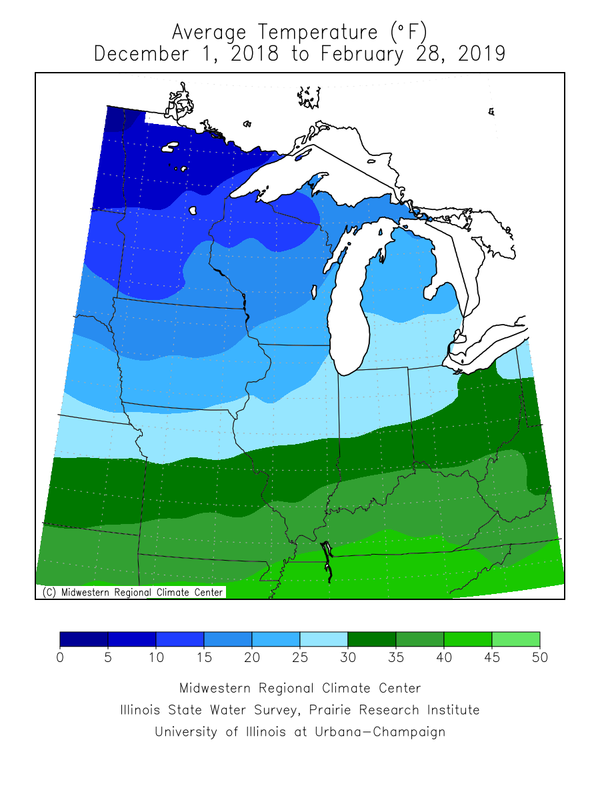 On the opposite end, locations in southern Illinois experienced temperature departures of 1-2°F above average during the 2018-19 winter season. Statewide temperatures averaged 29.9°F, 0.8° above the long term average. 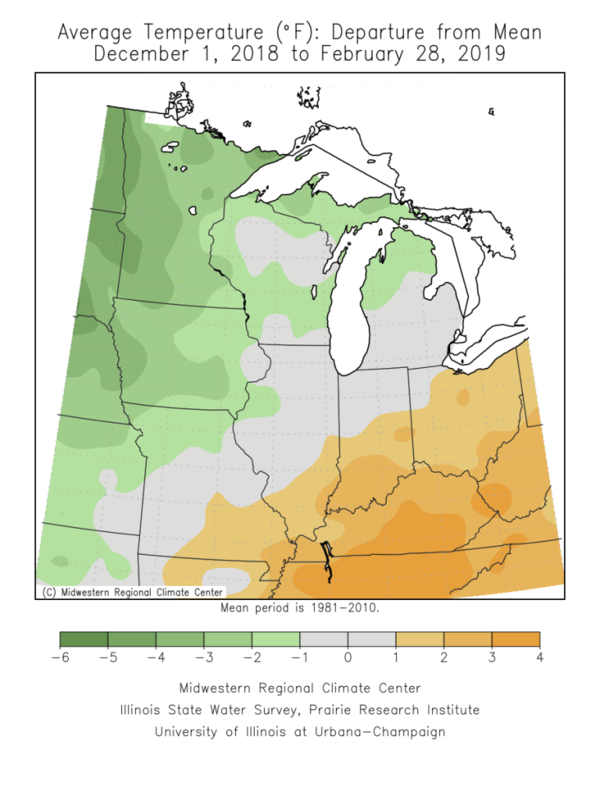 Average temperature for the season ranged from the low 20s north, to around 40° toward extreme southern Illinois. Large variations occurred with seasonal highs in the 70s and lows in the -30s. The maximum temperature of 71°F occurred on Dec. 1 at Kaskaskia Navigation Lock in Randolph County. The lowest temperature of -38°F occurred on Jan. 31 at Mt. Carroll in Carroll County, setting a new state record minimum temperature. 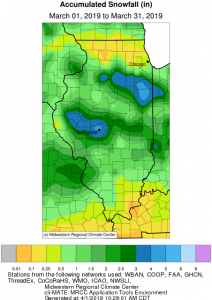 The last two days of January brought widespread cold weather to Illinois. Many locations experienced some of the coldest weather that has been seen in decades allowing numerous daily and station record lows to be broken. This event produced statewide temperature departures of 20 to 30° below average. To gain additional perspective on this event, the updated map below displays the minimum temperature recording at stations throughout Illinois with at least 20 years of data. 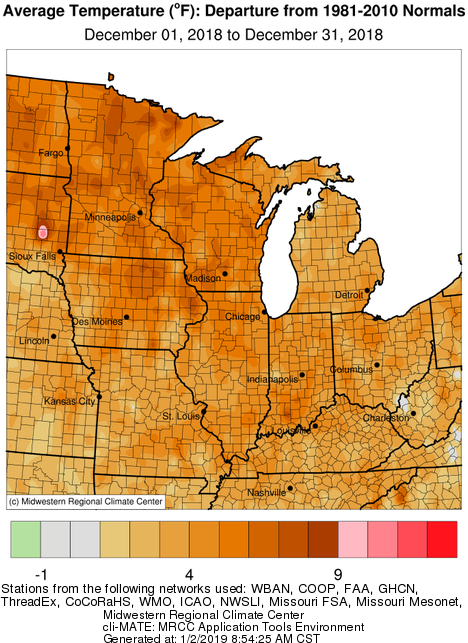 The color of the station plot represents the month of occurrence, and temperatures in bold represent new records that were set in 2019 (click the map for a larger PDF version). 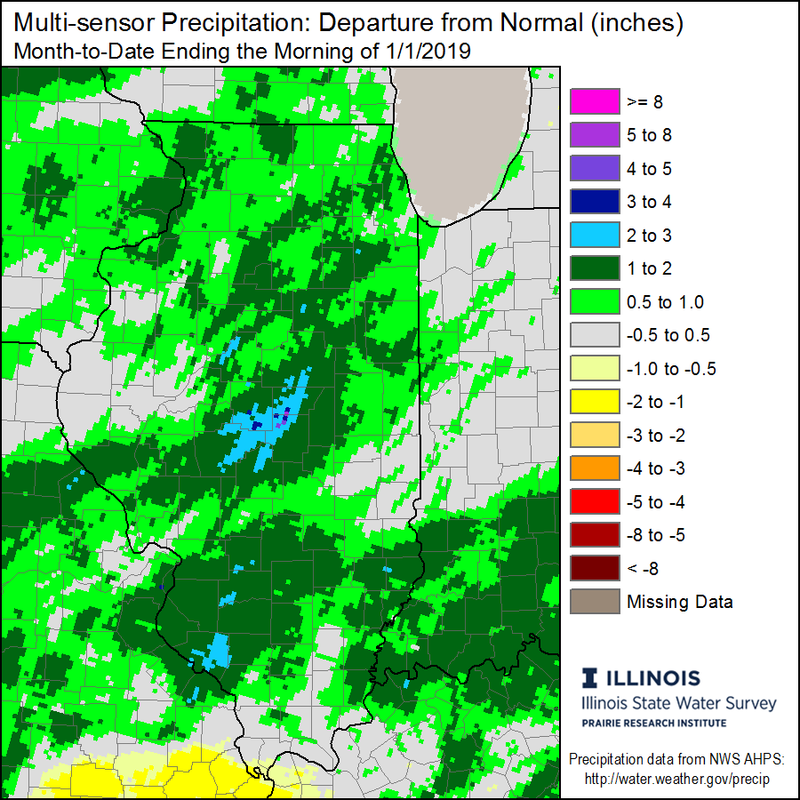 Precipitation was abundant throughout the state this winter season (see map below), this allowed the entire state to remain free of any abnormally dry, or drought designations during this period. 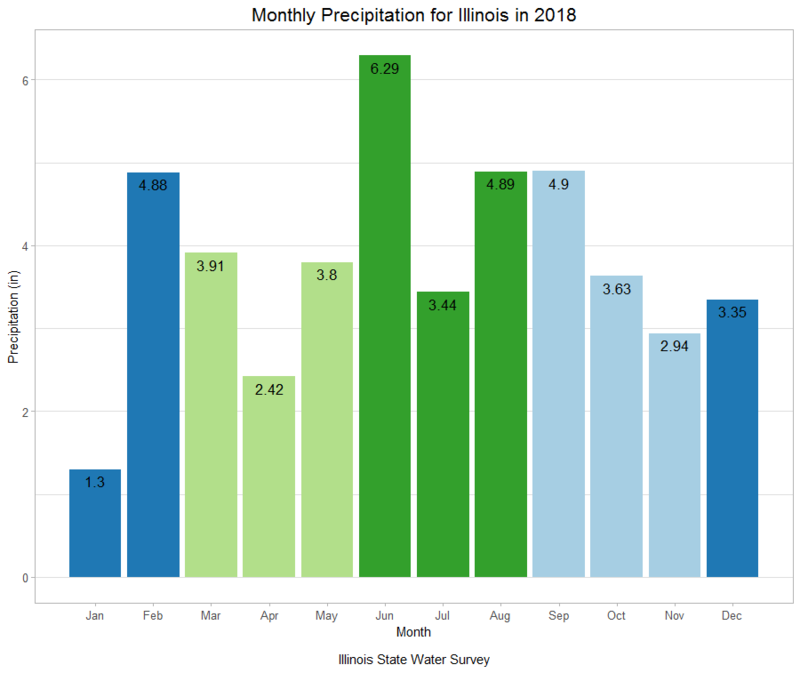 Above average precipitation occurred every month during the season. 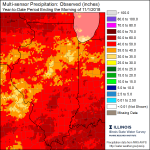 Generally precipitation totals across Illinois ranged from 5 to nearly 15 inches, with counties south of I-70 experiencing the most precipitation. Most remarkable was the 21.18 inches of precipitation reported at Smithland Lock and Dam on the lower Ohio River. 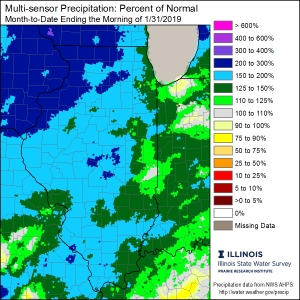 Overall, both southern and northwest Illinois received over 150% of their average winter precipitation, with several localities approaching 200% (see map below). Statewide seasonal precipitation averaged 9.67 inches, which is 2.85 inches above the long-term average, ranking as the 6th wettest winter season on record for the state (with records going back to 1895-96). 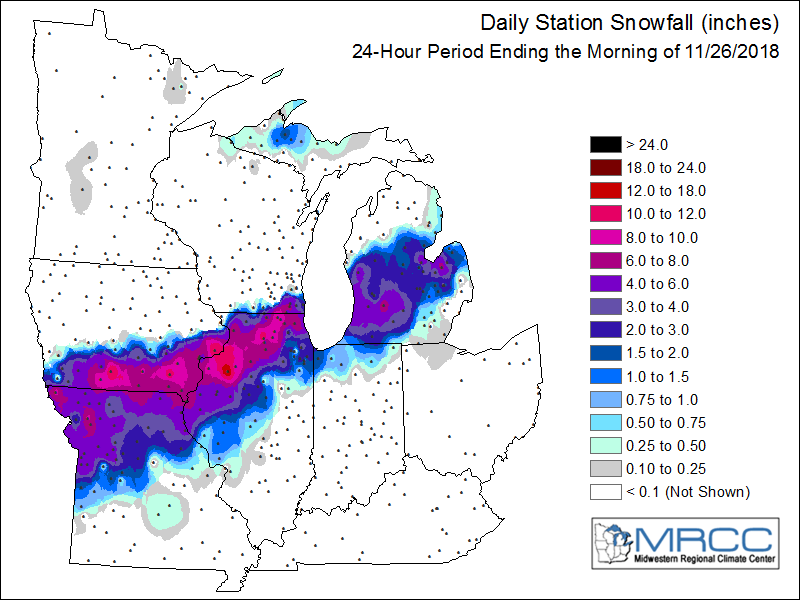 The total accumulated snowfall map shows that snowfall occurred statewide this winter, with the heaviest accumulations centered in northwestern Illinois, and counties along the Illinois/Wisconsin border. 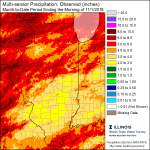 Totals ranged from 1 to 10 inches in southern Illinois, 10 to 20 inches in central Illinois, and 20 to over 40 inches in northern Illinois. February 2019 will be a month remembered for an unseasonably active storm pattern, a majority of the month was characterized by a seemingly constant succession of storms resulting in moderate snow accumulations for the northern counties, and persistent rain events and widespread flooding for the far southern counties. Between storm systems we experienced noticeable temperature swings, and periods of seasonable weather. 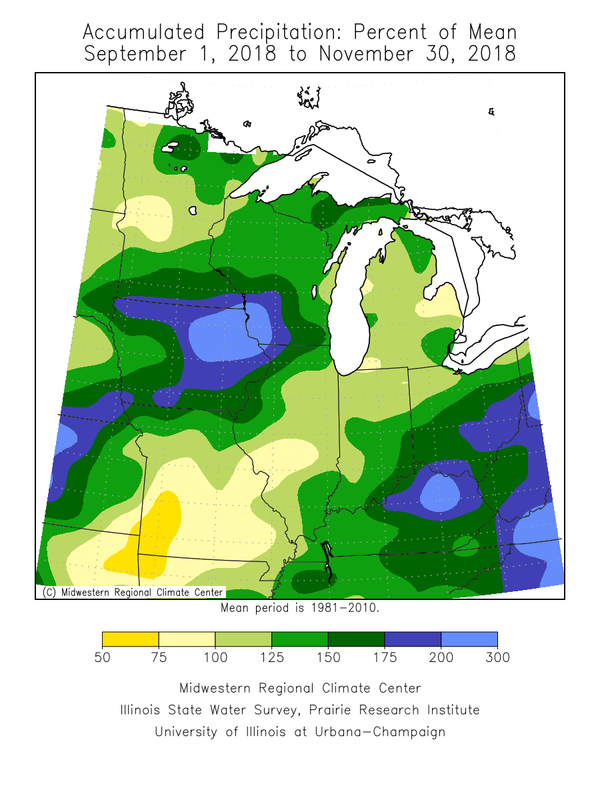 Statewide, February ended colder and substantially wetter than the long term average. The preliminary average statewide February temperature was 28.6°F, which is 2.3°F below the long term average. The preliminary average statewide precipitation was 3.33 inches, which is 1.27 inches above the long term average. 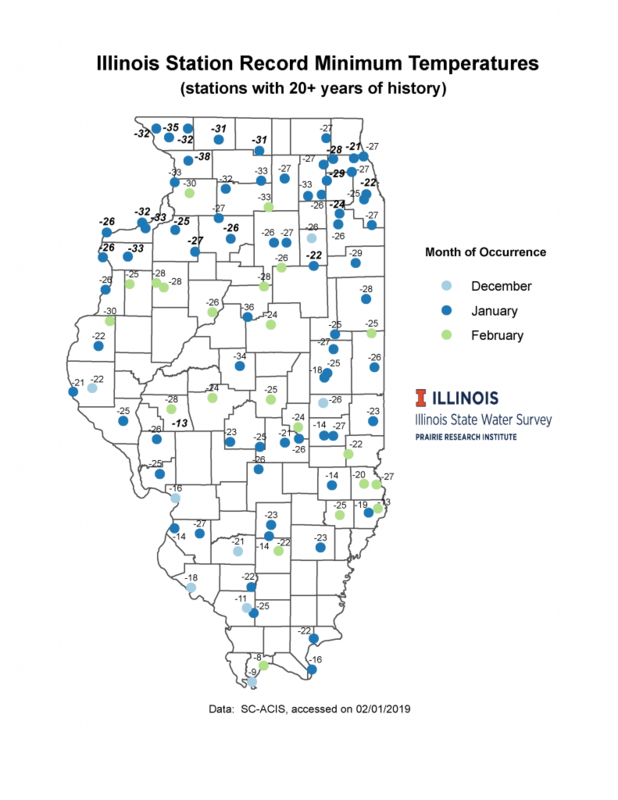 Preliminary results show that February 2019 finished with a statewide average temperature of 28.6°F which is 2.3°F below the long term average. The maximum February temperature of 70°F was reported at two stations, Dixon Springs (Pope County) on February 3rd, and Kaskaskia River Lock (Randolph County) on February 4th. These temperatures came less than a week after the historic Arctic outbreak in late January, which shattered numerous all time station and daily record lows across Illinois. Over the course of five days many stations across the state saw temperature differences of around 70 degrees or more from Jan. 31 to Feb. 4. The minimum state temperature was -36°F reported at the Mt. Carroll observation station (Carroll County) on February 1st, a day after the station recorded a potential record state minimum temperature of -38°F on last day of January 2019. The map below depicts average monthly statewide temperature departures for Illinois. In February, the departure gradients tended to align in a southwest to northeast fashion, following the larger scale storm tracks. 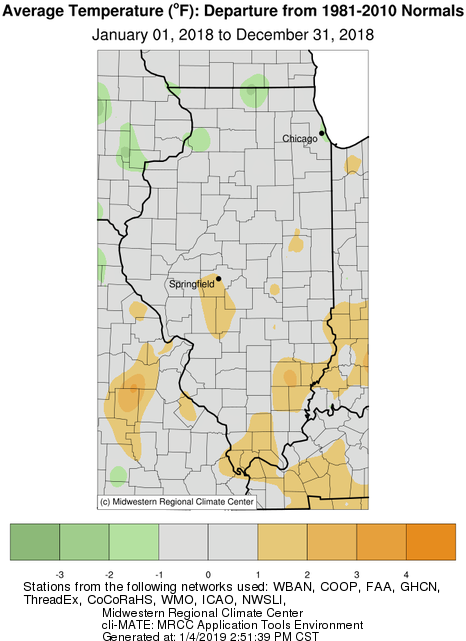 Overall, Southeastern Illinois saw temperature departures averaging one to three degrees above normal, while much of Central Illinois was near the long term average, and a larger region in the vicinity of Northwest Illinois saw temperature departures averaging two to five degrees below normal. Preliminary statewide average precipitation for February was 3.33 inches, which is 1.27 inches above the long term average. Total precipitation was one of the biggest weather concerns for February. 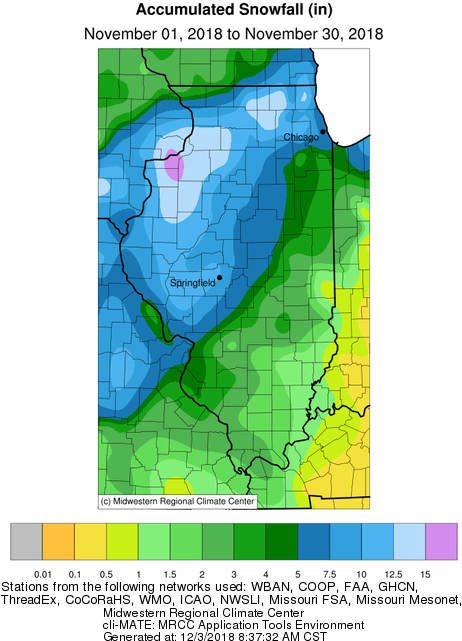 While locations in the center of the state, roughly between I-80 and I-70, received anywhere from 1.5-4.0 inches of precipitation for February, the most impressive totals fell in far Northwestern and Southern Illinois (see map below). 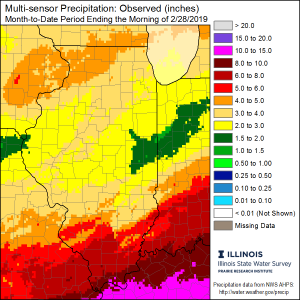 In Southern Illinois February totals in excess of 6.0 inches were common, with five stations reporting over 8.0 inches of precipitation for the month. The highest monthly total was reported at Smithland Lock and Dam (Pope County) with an impressive 10.68 inches. This ranks as the wettest February on record for the station, with records going back to 1981. The persistent February precipitation corresponded to monthly totals of 300-400% percent of normal for Northwestern Illinois, and 200-300+% of normal for Southern Illinois (see map below). Once final numbers are calculated, Feb. 2019 is on track to rank within the top 15 wettest statewide February’s on record. Abundant regional February rainfall also contributed to a major flooding event in the lower Ohio River. Both the Smithland Lock and Dam and Cairo river gauges crested at over 10 feet above flood stage during the last week in February. Maximum river stages are expected to be within the top 5 highest on record, according to data compiled by the National Weather Service. 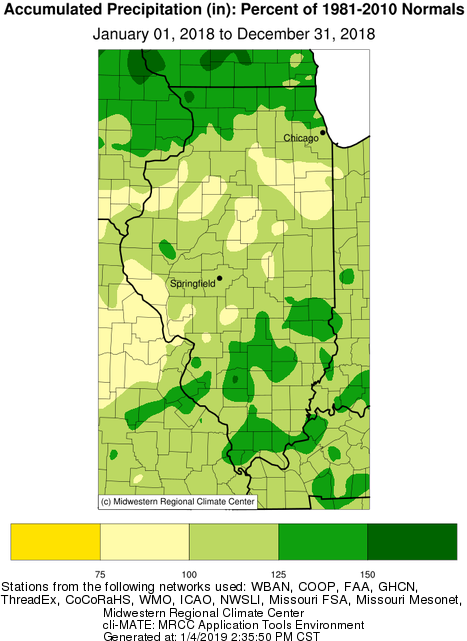 Soil moisture percentiles for the month of February remained in the 90th percentile or higher across Illinois. The highest point snowfall total of 25.7 inches was reported at a station in Galena (Jo Daviess County). 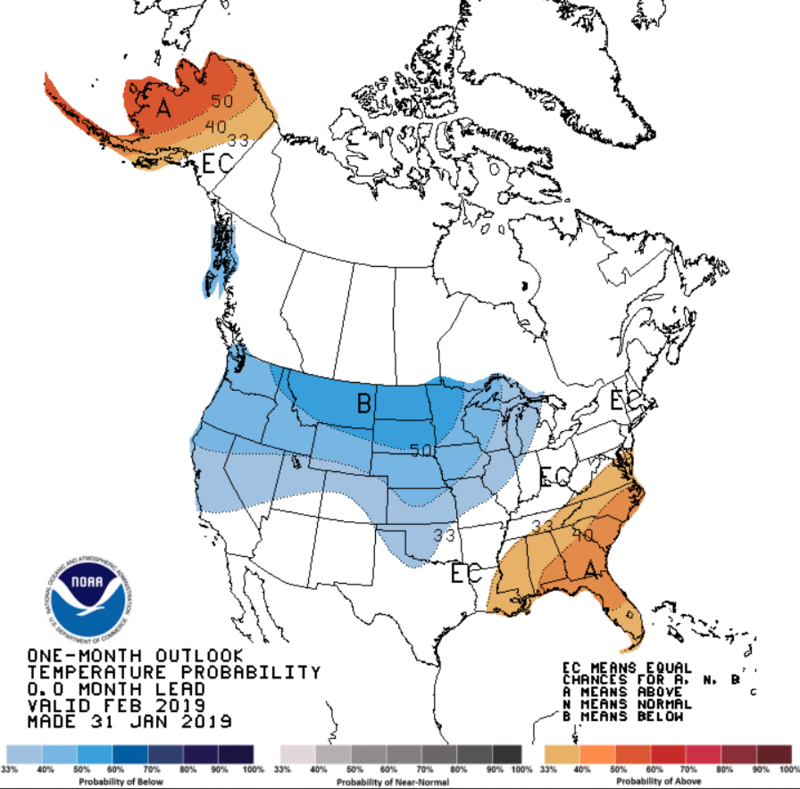 Looking ahead at the rest of March 2019, the Climate Prediction Center is favoring moderate probabilities of colder than average temperatures statewide. The highest probabilities are located in the northwestern portion of the state. 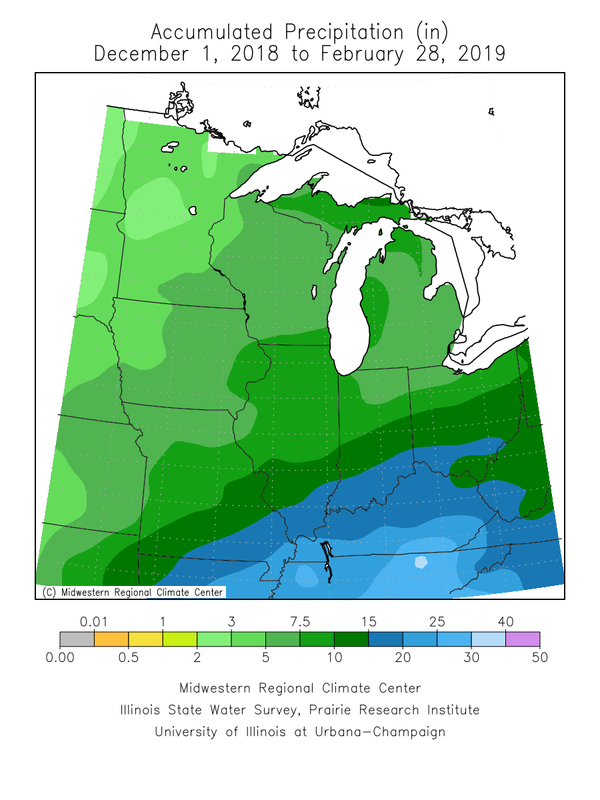 Slightly increased probabilities of a wetter than normal March are forecast for extreme southern Illinois, the same regions that have already experienced unseasonably wet conditions for a majority of the winter. Check back soon for a recap of the 2018-2019 meteorological winter season. 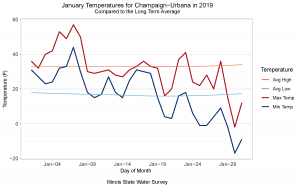 CHAMPAIGN, Ill., 1/31/19: Illinois has been experiencing some of the coldest weather that has been seen in decades and, in some locations, ever. The National Oceanic and Atmospheric Administration cooperative weather observer at Mt. 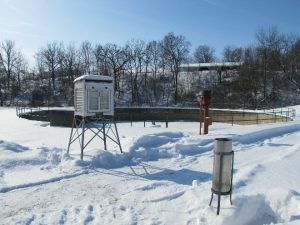 Carroll in northeastern Illinois reported a temperature of -38 degrees on the morning of Jan. 31. “The temperature in Mt. 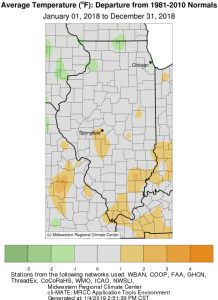 Carroll may be a new state record, if officially confirmed,” said Brian Kerschner, spokesperson for the Illinois State Climatologist’s Office at the Illinois State Water Survey. When it appears that a state record temperature may have been broken, a state climate extremes committee reviews the observations to assess its validity. 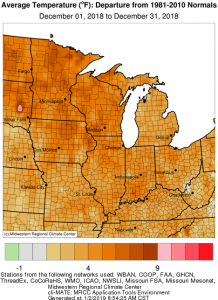 This team typically includes the State Climatologist’s Office, the Midwestern Regional Climate Center, and federal climate experts, such as from the National Weather Service and the National Center for Environmental Information. Most of Illinois has been in the deep freeze for the past two days. With a recording of -31 degrees, Rockford broke their all-time low temperature, which was previously -27 degrees on Jan. 10, 1982, the National Weather Service Forecast Office in Chicago reports. Some other notable temperatures included -35 degrees at Elizabeth, -32 at Galena, -30 at Rochelle, -33 at Aledo, -26 at DeKalb, -22 at Joliet, -21 at Galesburg, -17 in Champaign, and -16 in Decatur. Numerous schools, businesses, and government offices were closed throughout the state because of the dangerously cold wind chills. 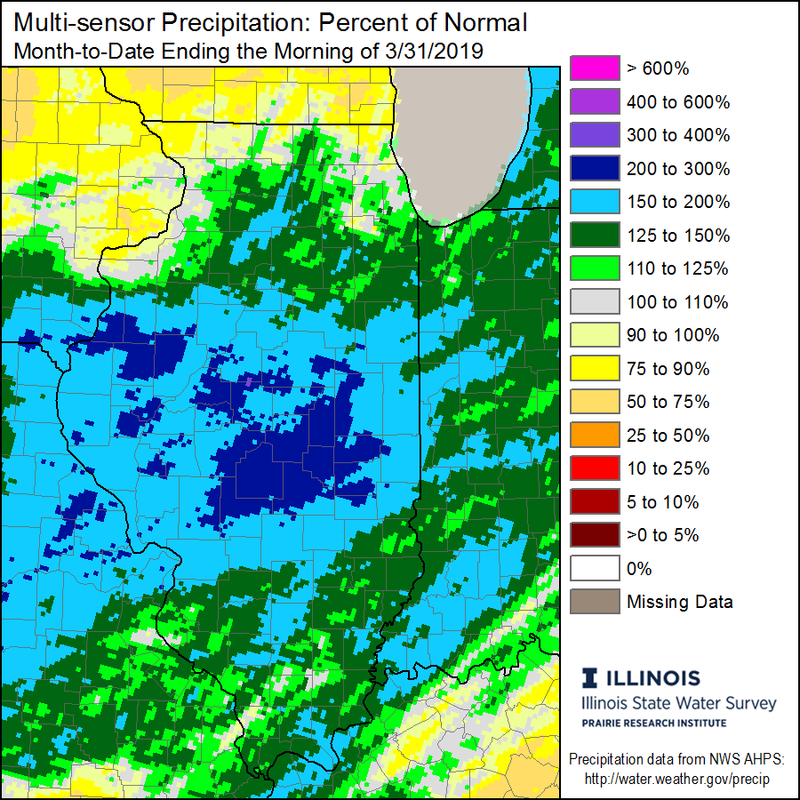 Note: Data for this press release were obtained from the Office of the Illinois State Climatologist, Midwestern Regional Climate Center, and National Weather Service Offices responsible for the state. Now that 2019 is well underway, lets take a moment to reflect back on the climate averages and departures from 2018. 2018 was a year marked with several climatologically dramatic temperature swings. 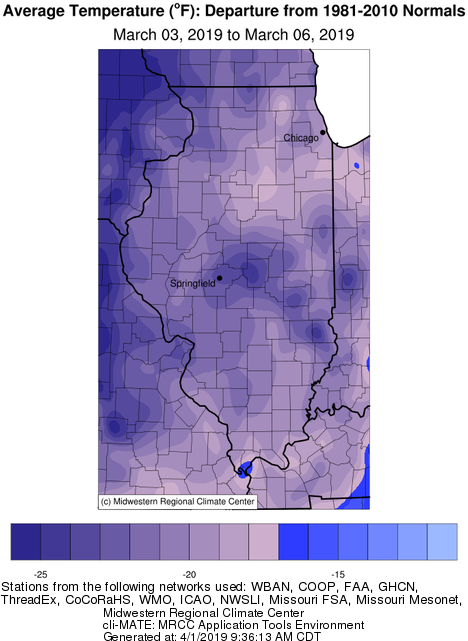 The chart below shows monthly temperature departures from the 1980 – 2010 long term average for Illinois. The most noteworthy feature is the -7.8°F departure that occurred in April, ranking April 2018 as the second coldest April on record for the state (records extend back to 1895). And with the turn of a calendar page, May saw a +8.0°F departure from the long term mean, ranking May 2018 as the warmest May in state history. 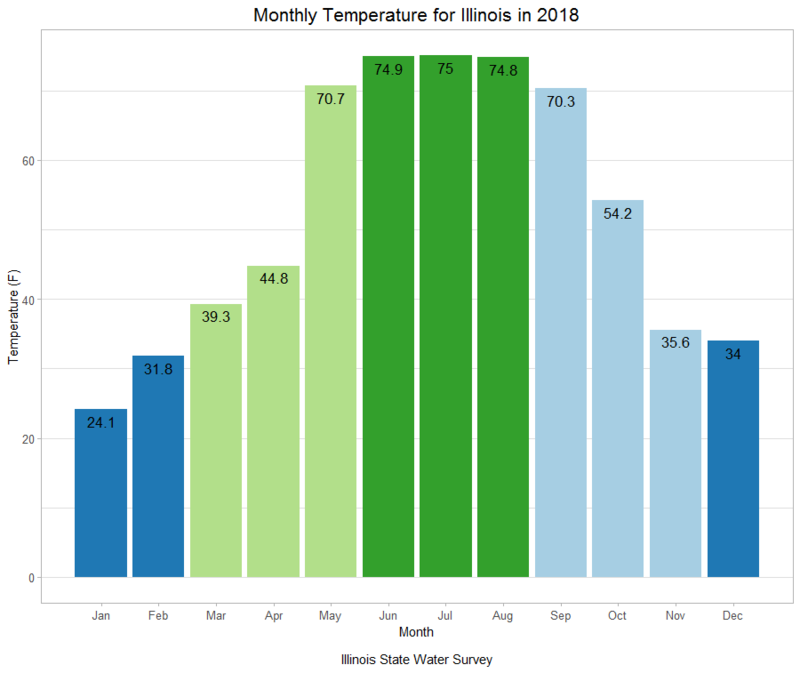 The plot below shows the average statewide temperature (F) by month for 2018, the colors represent meteorological seasons. The map below shows spatially average temperature departures for the year 2018. Despite several dramatic temperature swings throughout the seasons, the year as whole finished right around the long term mean statewide. A few regions in the northwest were a degree below, and a few regions in the south/southeast were a degree above the long term mean. The statewide average temperature for 2018 was 52.5°F which is 0.2°F above the long term average. The plot below shows the average statewide precipitation (in) by month for 2018, the colors represent meteorological seasons. The map below shows precipitation as a percent of normal for the year 2018 in inches. It was a rather wet year statewide, the highest percentages above average were reported in numerous regions across the extreme northern and southern portions of Illinois, where 125 to 150 percent of normal precipitation was measured. The statewide estimated average precipitation for 2018 stands at 45.75 inches which is an impressive 5.79 inches above the long term average. 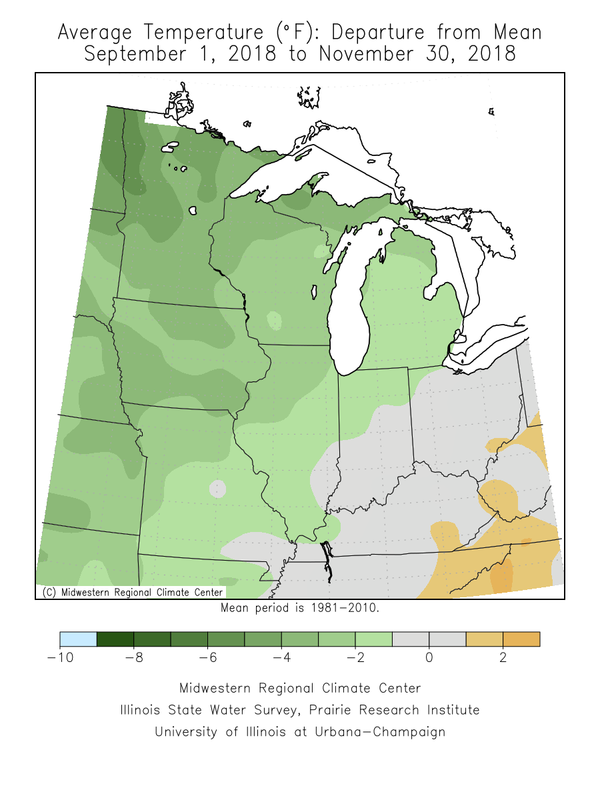 In contrast to November, December 2018 finished warmer than the long term average, was lacking in major winter storms, and brought a historic late season severe weather outbreak. The statewide average temperature for December was 34°F, which is 4.1°F above the long term average. The statewide average precipitation for December was 3.35 inches, which is 0.66 inches above the long term average. The highest temperature recorded for the month was 71°F on December 2nd at the Kaskaskia River Lock and Dam in Randolph County. The lowest temperature recorded for the month was 6°F on December 28th at both the Altona and Mount Carroll stations in Knox and Carroll Counties. 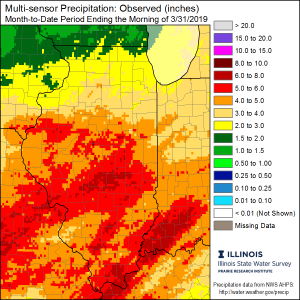 The highest monthly rainfall total of 6.83 inches occurred at a station near Chester, which is located in Randolph County. The highest monthly snowfall total was only 3.1 inches, and was recorded at a station near Patoka in Marion County. 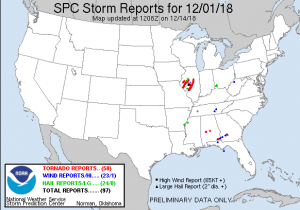 The National Weather Service confirmed 29 tornadoes in Illinois during the historic December 1st severe weather outbreak. December favored above average temperatures for the entire Midwest, including Illinois The map below shows that the largest temperature departures were felt in the upper Midwest, and extending down into much of northern Illinois where several locations finished the month 6 to 7 degrees above the long term average. Overall, the statewide average temperature for December was 34°F which is 4.1°F above average. Statewide precipitation totals for December were at or above the long term average. 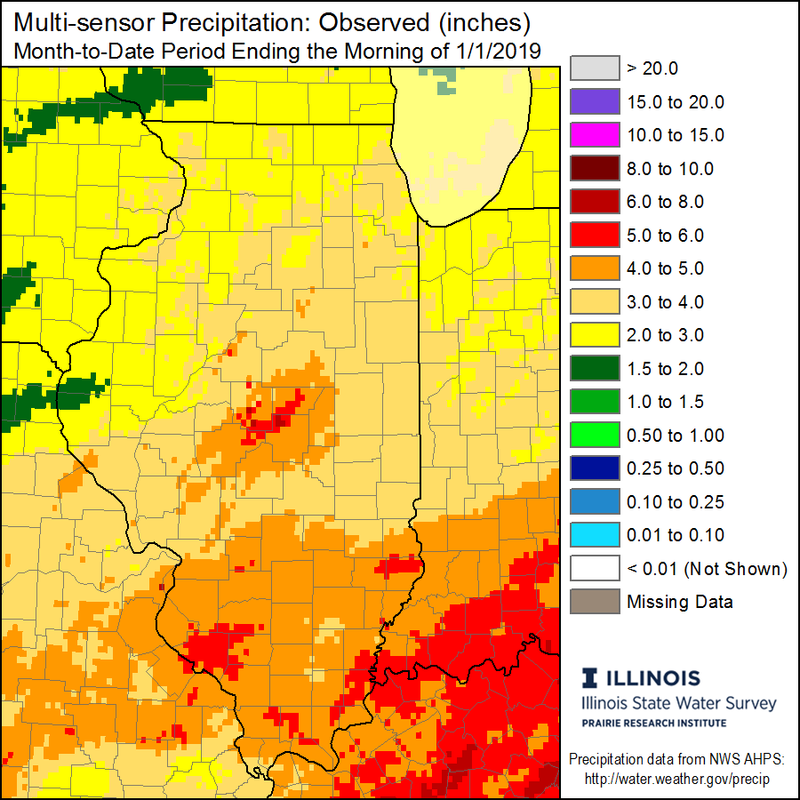 Two storm systems impacting the state during the last week of December helped to bring the monthly totals above normal for much of central and northern Illinois, where precipitation was lacking in the middle of the month. 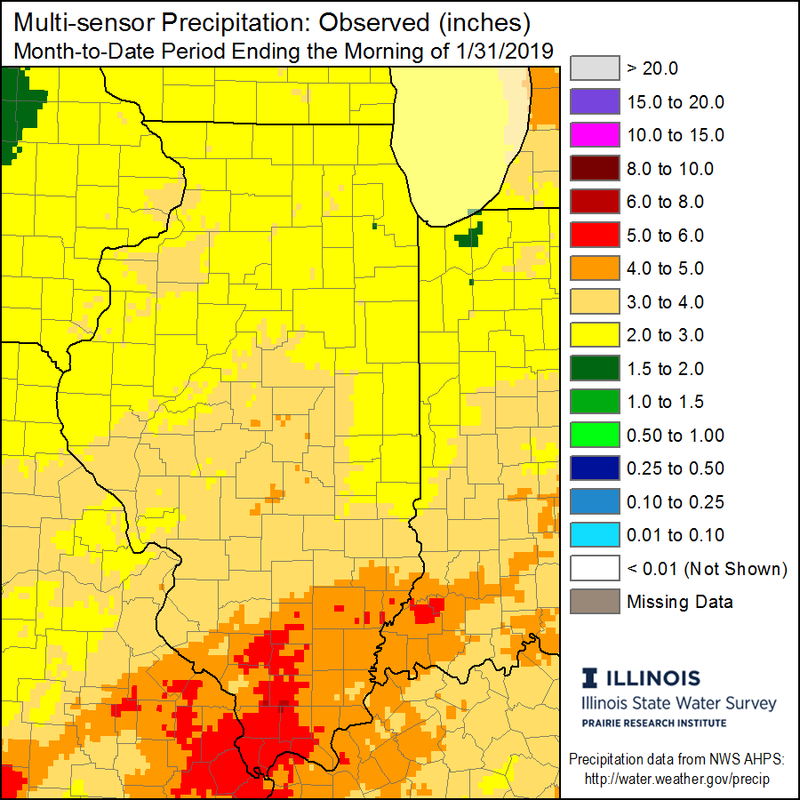 The highest widespread precipitation totals occurred around and south of I-70. 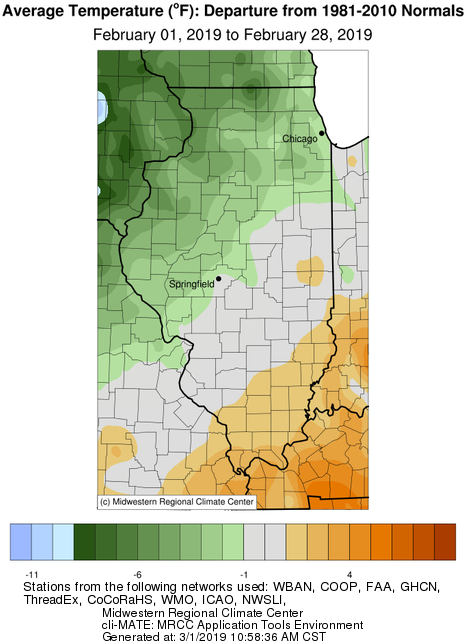 The maps below show total December precipitation, as well precipitation departures for Illinois. December was not an ideal month for snow lovers as warmer temperatures, and a combination of environmental factors kept December snow accumulation to a minimum. The highest accumulations were in the northeast, and in central/west central portions of the state – where a quick moving cold front brought a majority of the snow accumulation during the first week of December. Total snow accumulations are shown in the map below. Most notable was the Taylorsville Tornado in Christian County. This tornado had a path width over 1/2 mile wide, and estimated wind speeds of 155 mph, ranking it as an EF-3 on the Enhanced Fujita Scale, The Taylorsville tornado caused major damage to 100 homes, and 22 reported injuries. The map below, from the Storm Prediction Center, pinpoints locations of all severe weather reports from 12/1/2018. It is evident that the worst of the severe weather, and tornadoes, were confined to west central Illinois. 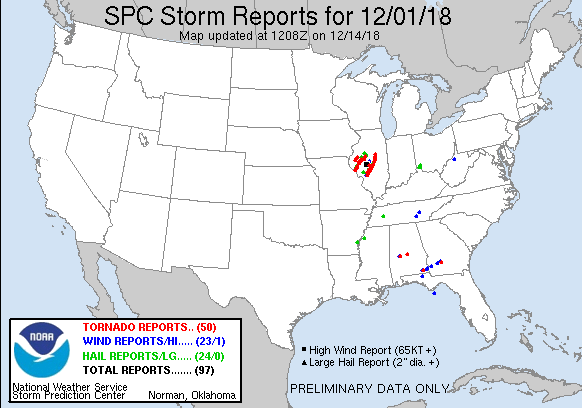 In total, 52 severe weather reports were recorded for Illinois this December; 34 reports for tornadoes, 11 for severe hail, and 7 for severe wind. Note: It is possible for multiple reports to be created for the same event/storm. — Kevin Lighty (@KevinLighty) December 2, 2018. Looking ahead at the rest of January 2019, the Climate Prediction Center is forecasting an above normal chance for a drier than average January for a majority of the state. The highest probabilities are centered over northern Illinois and the Great Lakes. Focusing on temperatures, the highest probabilities for above average temperatures are concentrated over the upper Midwest and North Dakota, with a smaller probability extending into northwest Illinois. 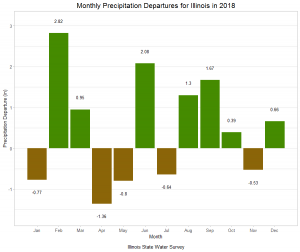 Be sure to check back in the coming week for the ‘Illinois 2018 Climate and Weather Recap’ blog entry. It was a cold and snowy November in Illinois. The statewide average temperature for November was 35.2°F, which is an impressive 7.3°F below normal, ranking November 2018 as the 8th coldest on record. The statewide average rainfall for November was 3.11 inches, which is 0.36 inches below normal. The highest temperature recorded for the month was 70°F at a station in Du Quoin on the 1st day of the month. The coldest temperature recorded for the month was a chilly 1°F at three stations in Lee, Carrol, and Knox County on the night of the 28th. The highest monthly rainfall total of 7.50 inches occurred at a station in Belknap, which is located in Massac County. 5.51 inches of the total was recorded during a one-day event on the 1st of the month. The highest monthly snowfall total of 18.5 inches was recorded at a station in Bull Valley, which is located in McHenry County. November was an exceptional month for snow lovers statewide, with virtually the entire state seeing it’s first accumulating snow of the season before the month’s end. In fact by the 15th, with half the month still to go, Springfield Abraham Lincoln Airport had already broken the record for the snowiest November. 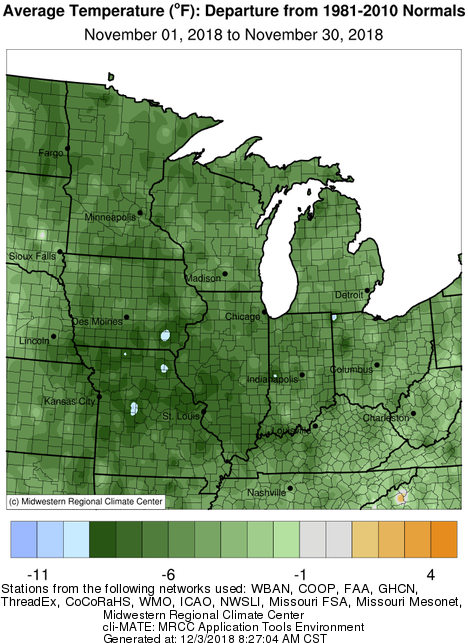 Overall monthly snowfall accumulation totals averaged around an inch in southeastern Illinois, up to 15 inches in the northwest, near the Quad Cities, with several locally higher amounts reported. 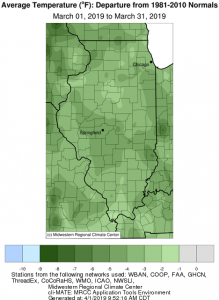 Several outbreaks of unseasonably cold conditions throughout the month helped in bringing the statewide averaged November temperature to a chilly 35.2°F. 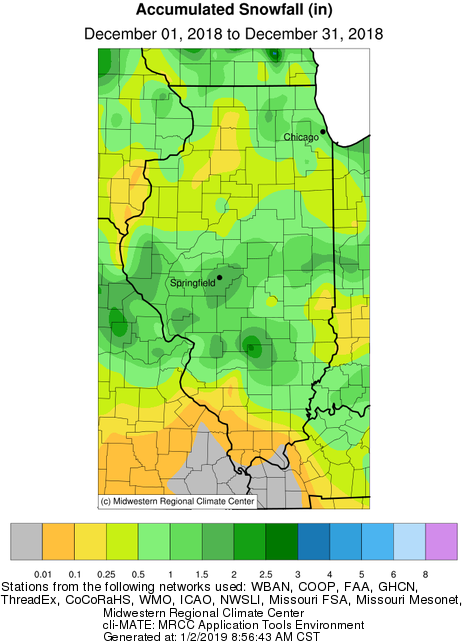 Temperatures across Illinois were typically on the order of 5 to 10 degrees below normal, a trend that was felt across most of the Midwest. The map shows the bullseye for the below normal cold concentrated in sections of northeast Missouri, southeast Iowa, and west-central Illinois. 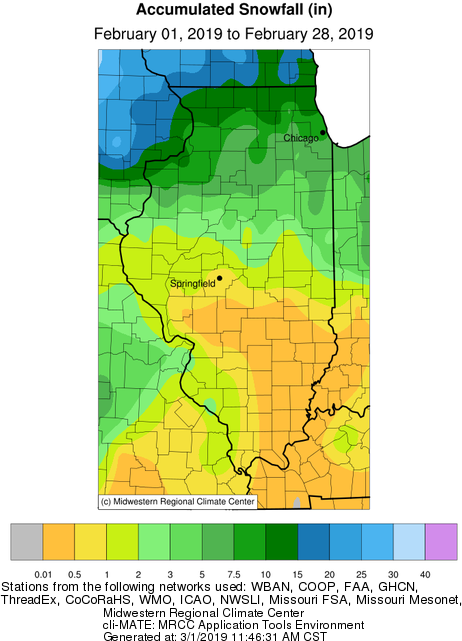 Looking at meteorological Fall (Sept, Oct, Nov), temperatures for the season ended up near normal in southeastern Illinois, and between 2 to 4°F below normal as you head northwest toward Rockford and the Quad Cities (see map). 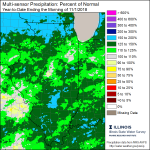 Precipitation for the same period is near normal for the central portion of the state, with above normal totals in the northwest and southeast. Precipitation totals at Chicago O’Hare and Rockford Airports are currently ranked as the 4th wettest years on record, with a month still to go. 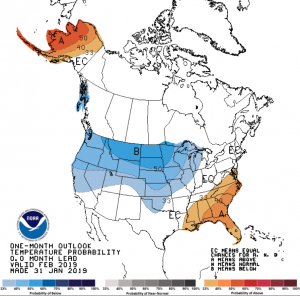 Finally, here is the outlook for December that was released by the National Weather Service (NWS) Climate Prediction Center (CPC) on November 30th. The precipitation maps show an increased chance of above normal precipitation statewide, becoming more likely as you head westward towards Nebraska. Temperature wise, there is a slightly increased chance of above normal temperatures statewide, a trend which is noted for much of the eastern half of the country. 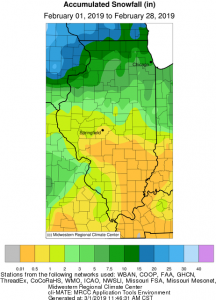 Rainy Start to November for Southern Illinois. 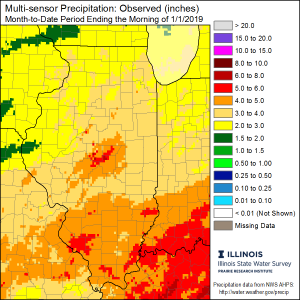 November started with several substantial rain events bringing a half to an inch and a half of precipitation to most of the state, with the largest amounts in southeastern Illinois. Two CoCoRaHs stations in Massac County, and a COOP station in Pope County recorded over 6 inches of rain during the first week of November. Mid-month Snowstorm and Canadian air outbreak. An early season plowable snowstorm, accompanied by unseasonably cold temperatures affected much of the state November 14-15th. As much as a half foot of snow was reported in locations south and west of Springfield. The official total at Springfield Abraham Lincoln Airport was 5.3 inches. Total monthly snowfall accumulation in Springfield measured 11.4 inches, ranking November 2018 the snowiest November on record. A potent low-pressure system tracked through central Illinois to finish off the Thanksgiving weekend, bringing a wide range of weather to the state. Thunder, rain, ice, snow, wind, and blizzard conditions were all reported in varying locations on Sunday 11/25/2018. The map below shows station interpolated snowfall totals for this event. Peak wind gusts of 55 mph were reported at Champaign Willard Airport, and 52 mph at Chicago O’Hare. The measured snowfall totals of 11.7 inches at Rockford, and 13.3 inches at Moline, ranks this event as the largest November snowstorm on record for both locations. The total November accumulated snowfall in Rockford of 15.8 inches, and Moline of 18.4 inches ranks November 2018 as the snowiest November on record for both locations. A fresh snow pack, coupled with cold air behind this system allowed temperatures to plummet during the start of the last week in November. Both Moline, and Chicago O’Hare set a record low maximum temperature on 11/27/2018, with recordings of 22°F at Moline and 25°F at O’Hare. This post was written by Brian Kerschner, who will be taking over the blog next month. I love the weather in Illinois – hardly ever a dull moment. This October we experienced days in the 90s, the first fall frost, the first snow of the season, and widespread heavy rains. The statewide average temperature departure for the first 9 days of October was 11.5 degrees above normal. There were many reports of temperatures in the 90s during this period, including a high of 94 degrees in Fairfield on October 7. After the passage of a strong cold front, temperatures dropped and remained much cooler for the rest of the month. 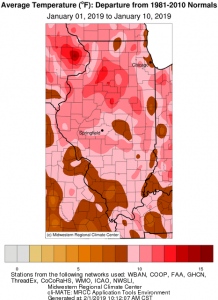 The temperature departure from October 10-31 was 5.7 degrees below normal. The warm and cold periods balanced out, leaving the statewide average temperature for October at 54.0 degrees, 0.4 degrees below normal. 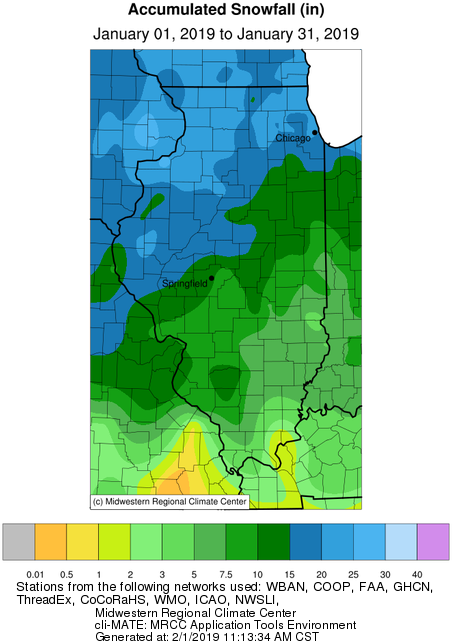 Freezing temperatures arrived across most of Illinois on October 21st. The lowest reported reading was 19 degrees at locations near Stockton, Shabbona, and Champaign. Historically, the average dates for the first fall frost are in October across the state. 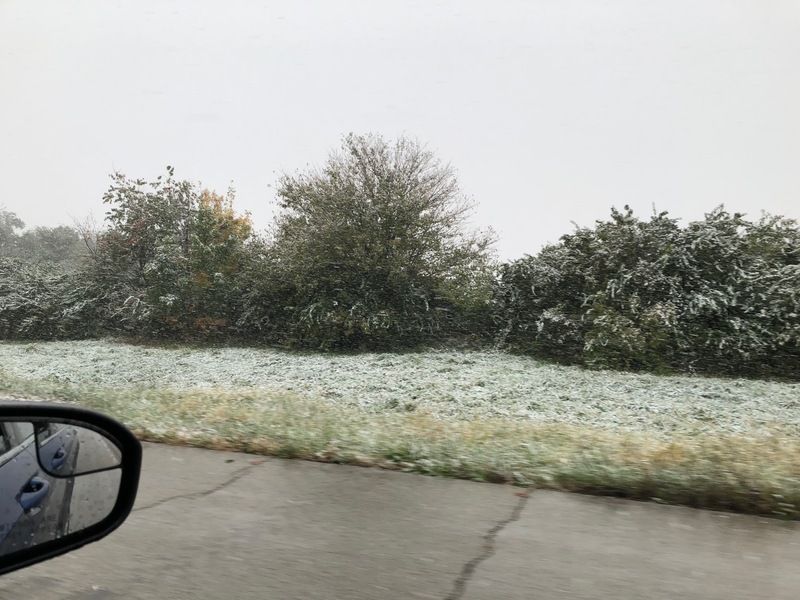 The first snow of the season fell on October 12th. I happened to be driving through it between Kankakee and Champaign (photo below). There were widespread reports of traces of snow, meaning it melted as it fell. A few areas reported a small amount of accumulation, including Moline and Bloomington with 0.2 inches. We do not always see snowfall in October in Illinois, but it does show up in the records from time to time. However, it is not a reliable indicator of the upcoming winter. Precipitation was widespread across Illinois in October. The statewide average was 3.81 inches, 0.57 inches above normal. Amounts of 4 to 7 inches or more were common in the northern half of the state, which is well above normal. Meanwhile, most of the southern half of the state was drier with amounts in the 2 to 4-inch range, which is much closer to normal for October. The largest monthly total was 8.07 inches in Nauvoo (Hancock County). 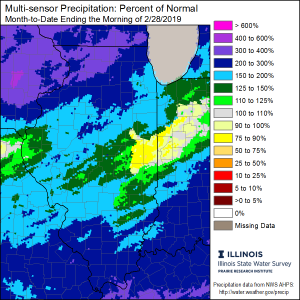 Another interesting feature of 2018 so far in Illinois has been the impressive precipitation totals in northern Illinois. 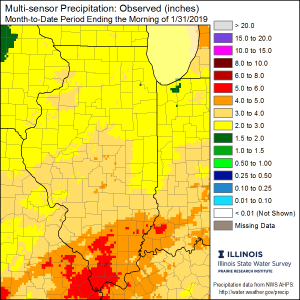 Several stations have received over 50 inches of precipitation through October 31, including Elizabeth (Jo Daviess County) with 54.45 inches. That is 22.66 inches above normal! 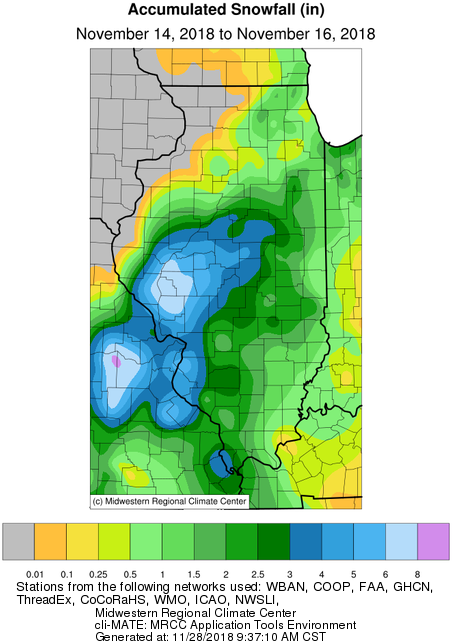 The maps below show the extent of the amounts over 50 inches scattered across the state (darker red), while a relatively drier band stretches from St. Louis to Chicago.